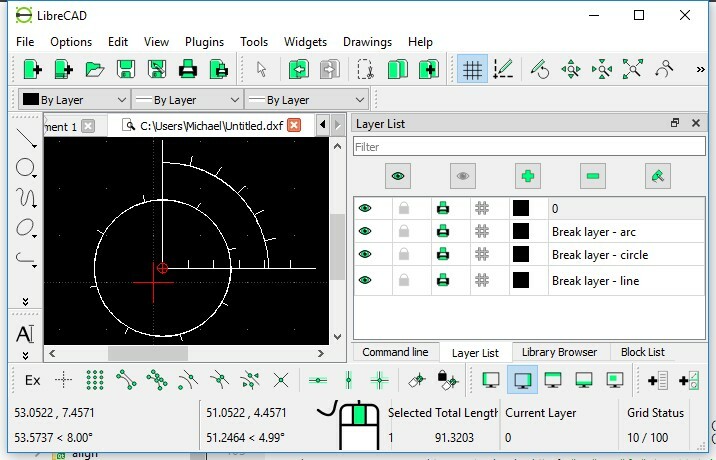 You will have to know how to set up and install a new plugin from scratch and build LibreCad from source. It compiles on linux without errors but I don't know how to set up an entry in the plugins menu on linux. About MAC OS X, I have no idea. then you can manually divide. This looks awesome. I' ll try it over the weekend. I've taken the liberty to add your code to our main repository. The only difference on Linux and OS X is the path to the plugin binary. Menu entries are created automatically by plugin interface, when the binary is found in plugins folder. How about your git skills? Rename :- I used DivideOptions as you already have a menu entry and cmdline entry for Divide. Split :- I did them as one file, as they are quite short. Github account :- I have one. The source code has been revised serveral times and updated today 28-8-2013. I've updated the source to split the the header & the *.cpp files. 13:30 today. I've left the headers with *.hpp extensions. Sorry, I lost focus on this. First let me say again, that your efforts are more than welcome! If you want to put more work in your plugin, I see two ways. 1) It is extra work for us to merge your contributions into code base manually, I won't do this too often. So if you won't invest in learning some git basics, I would wait for a more final version to merge manually again. 2) If you are willing to give git a try, I can merge latest changes when you are ready for it and then you can continue with your own forked repository. This allows automatic merge for us, which is much less time consuming. Important, when you go with git, is to work on a separate branch. Otherwise, working on forked master branch will mess up things and makes automatic merging impossible. No matter how you decide to go on, you're contribution is welcome. Don't hesitate to ask if anything is obscure, this can save time for all of us. Don't hesitate to ask if anything is obscure. At the moment, I have no idea how to 'Divide/Break' from a C++ program. I did think of sending a string of commands but can't work out how to do this. Any sugggestions would be appriciated. I'll think about using github. I'm still playing with this. LibreCad's command box and hit return it works as expected. What I can't work out is how to write to the command line box from within my C++ program. Any help/advice would be appriciated. The command box is not the correct place for plugins to modify entities. There is no interface to communicate with command box from plugins. My research shows that the plugin interface lacks some function for your needs. What you can do with the current interface is to add entities, which represent the split entity. Additionally to the tick entities, add multiple lines or arcs, e.g. on a new layer, to match the origin entity. What the plugin interface is missing, is a method to delete the origin entity (Document_Interface::deleteEntity()). This is noted in the class header comment. Another way would be to implement method Plugin_Entity::split() like Plugin_Entity::rotate() or Plugin_Entity::scale() to split the original entity. You can look at RS_Modification::cut() to see how the divide function works in LibreCAD. The origin entity is deleted and two new entities are inserted in place of the previous entity. This is how your plugin should handle it too, delete the origin and insert multiple smaller entities to create the split contour. Breaks & ticks are working on lines, circles and arcs. Break entities will be drawn on a new layer that will be auto created as shown. Many thanks for your improvement. When you will have a break for a couple days, let me know. Then I can review and merge your changes to github and you can continue from official code after that. I've finished for a while. These work on the ticks and breaks. Wow, thanks, awesome work and dedication. Now includes drawing the splits/breaks. Congrats for joining github and pushing your first commits to your fork. Fortunately I could merge your commits, because you committed on top of the latest main repo commit and the main repo wasn't changed meanwhile. This is not the common way, as it could happen, when you work on your fork, that the main repo is changed by commits. Then, when you work on your forks master branch, the main repo and your fork diverge. This will give conflicts and you can't easily sync your fork with the main repo. The workflow, when you work on your fork is to switch to a new branch. This will switch to the branch dividePlugin where you make your changes and commits. When your work is finished, you can create a pull request in the main repo. After your branch is merged in the main repo, you can switch back to master, delete your dividePlugin branch and sync your master branch with the upstream (main repo). Now, as I have merged your commits, you have to update your fork to stay in sync. As I've managed to screw it up, I think you shoud compile and check it works, l'll revert to adding to DropBox. The only thing left for me do on this is to add polylines, this won't happen for 2/3 months. Travis CI has checked this, your commits have build fine. Also the Windows nightly builds will run tonight, so we'll know more tomorrow. Don't worry.